I am a big fan of Mumford and Sons (A.K.A Marcus Mumford singing Ben Lovett playing piano, Winston Marshall playing banjo and dobro and Ted Dwane playing double bass) and I am currently listening to their second album “Babel”, which was released on 24th September 2012 and steps up Mumford & Sons’ game without changing it too much. It feels slightly shinier, punchier, more arena-scale than the debut album, Sigh No More, which was released in October 2009 to much critical Acclaim and rave reviews, won the band a UK Brit Award in 2010 (Best Album), was nominated for the prestigious Mercury Prize Award and also picked up two Grammy nominations (Best New Artist, Best Rock Song). The new album has the band hollering, hooting, plucking and strumming like Olympian street buskers and the songs lean toward hooky folkfest stomps like “Little Lion Man” and “The Cave.” The album contains the tracks: Babel, Whispers in the Dark, I Will Wait, Holland Road, Ghosts that we Knew, Lover of the Light, Lover’s Eyes, Reminder, Hopeless Wanderer, Broken Crown, Below my Feet and Not with Haste, and is also full of all manner of religious shoptalk, with Biblical metaphors and the first hymnlike tunes, “I Will Wait,” and “Lover of the Light” – are proof that the Mumfords do dramatic builds, dropouts and soft-loud shifts as impressively as U2. There are also subtler and more British folk elements. Other highlights on the album include “Below My Feet.”, “Lovers’ Eyes” “Whispers in the Dark,”and”Broken Crown”, but all the songs are growing on me gradually. 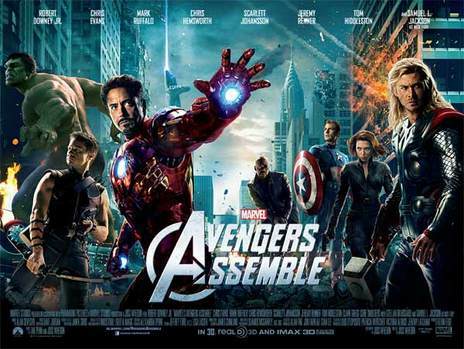 I have recently watched Director Joss Whedon’s latest film “Avengers Assemble”, again, which starts after The Villainous Loki (Tom Hiddleston) attacks the headquarters of International peace-Keeping agency S.H.I.E.L.D and steals a powerful device called the Tesseract which contains unlimited Energy, and which, in the wrong hands, could wipe out the human race. So Nick Fury (Samuel L. Jackson) the boss at S.H.I.E.L.D calls upon “Earth’s Mightiest Superheroes” The Avengers – Iron Man (Robert Downey Jr.), Captain America (Chris Evans), The Incredible Hulk (Mark Ruffalo), Thor (Chris Hemsworth), and two of the world’s greatest assassins, Black Widow (Scarlett Johansson) and Hawkeye (Jeremy Renner) to recover the Tesseract, defeat Loki, who is possibly the darkest villain the Earth has ever known, and pull the world back from the brink of disaster. Sadly though at first the team don’t get on at all – Stark describes Hulk as having ‘breathtaking anger management issues’, Tony Stark, himself is described as a volatile, self-obsessed loose cannon, who doesn’t play well with others, and Captain America, is a stiff-upper-lip product of the Forties, whose values are at odds with those of modern society. and Soon the differing attitudes of the superheroes have them acting at cross purposes, giving Loki and his cronies free reign to run amok & trash Manhattan. However this proves to be just the motivation the Superheroes need and they soon realise that they must coordinate their efforts and all work together in order to defeat Loki and his rampaging hordes, then the movie builds into a stirring and exciting climax.